Last working week pre Christmas and meet-up plans have fallen like Bob Mortimer on Novelty Island. The fire may well be so delightful, but baby it's cold outside. I'm WFH -- it's not too warm inside either -- and determined to land one more Ippo lunch, so call up Big G. He's not buying. He's gotta go food shop. He say no, the two letters I will not take for an answer. Where you pushing your trolley, I say? Aldi, says he, then on to Asda's. Picking myself up from that painful plural, I propose we meet at the latter's caff. 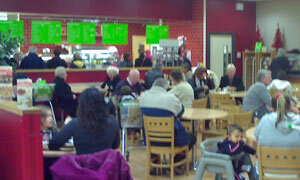 No strangers to a supermarket, we've previously ticked off two of the other Big Four, namely Mr Sainsbury and Mr Tesco. Now for Asda, a mile or so away. Deciding the bike was a stooopid idea, it's into the car and into the slushy queues for the ice rink stroke car park, circling for a space. Ten minutes late and still the first to arrive. Had to titter at the "light options" offerings of chips & gravy or a chip butty. Those beautiful people have it made. Seating area is impressively self-regulating, a fine stochastic demonstration of queueing theory. In other words, you'll get a table if you hang around. I'm wiping the last of the branded Heinz condiment from my lips at Grenvyle saunters in. In a jiff he's sitting down with not one but two baps! Which prompts me to go round again and try the equally top value sausage bap, "now served with three sausages." Eyes bigger than my belly syndrome emerged about 2.5 bangers in. Bit like Ikea, you pay for the empty coffee mug, then serve yourself. I've paid a lot more and had a lot worse. Pudd selection wasn't great -- if it's not on display, it's not available -- and I needed a sweet like a hole in my sock. So, just a pre-packed caramel slice. If it was a car -- Mini Metro. If they were passing by -- Coleen McLoughlin.